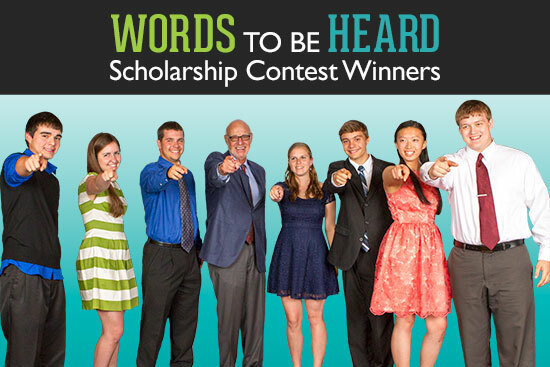 On Monday, May 20, the partners and I had the pleasure of meeting seven outstanding high school seniors who were selected as the 2013 "Words to be Heard" Scholarship recipients at a dinner held in their honor. This was the 7th year for the contest that began in 2007. Since then, we have awarded 63 scholarships totaling $86,000. High school seniors throughout Western Pennsylvania were encouraged to create programs discouraging their peers from underage drinking and drunk driving, or texting while driving. We encouraged students to be creative and choose from a number of different formats that included video, PowerPoint presentations, websites, essays, or any other format of their choice. Over 300 entries were submitted so choosing the winners was not an easy task. The 2013 scholarship recipients were chosen by an outside panel of judges that included Chris Vitale, manager of the injury prevention program at Children's Hospital of Pittsburgh UPMC, Corporal Christopher Murray of the PA State Police, Deputy Sheriff Jason Tarap of the Allegheny County Sheriff's Office, and Maddie Seel, a junior at Shaler Area High School and the 2013-2014 PA SADD student of the year. As you can tell from their titles, all of these individuals promote safety in their everyday lives. Katherine Zhou of North Allegheny High School was chosen as this year's $5,000 grand prize scholarship recipient. Katherine created a texting and driving video titled "Drive from Distration. Life is a highway and the lanes are your choices. Where will you go?" The three $2,500 scholarship winners included Matthew Clark of Pine-Richland High School, Lindsay Spinabelli of Peters Township High School, and Jesse Vensel of McGuffey High School. Three $1,000 scholarships were awarded to Alexandria Denne of Gateway High School, Brady Sheehan of Windber Area High School, and Michael Trowbridge of Bellefonte Area High School. I invite you to view this video that features all of their winning submissions. Prior to the scholarship dinner, each of the recipients got to participate in a live Google Plus Hangout with me where I had the chance to get to know a little more about each of them. The partners and I really enjoyed spending the evening with these exceptional students and their families. We congratulate them again, and wish them well in their future endeavors.